The two winning entries from last year’s Plain English Awards threw an intriguing spotlight on the critical influence of tone in formal writing. Tone is a component of style, and its job is to set the reader’s mood. Tone is the difference between I would like to review your performance and I’d like to see how you’re getting on. Different tones spark different moods. Audience mood is important because information tends to be more compelling when we find it easy to understand and we feel confident about the communicator’s capability. This is only the sixth sentence of this article, but hopefully I have already put you at ease through my choice of a familiar tone. The photo (below, of me being interviewed on Breakfast) is there to boost your confidence in my capability. 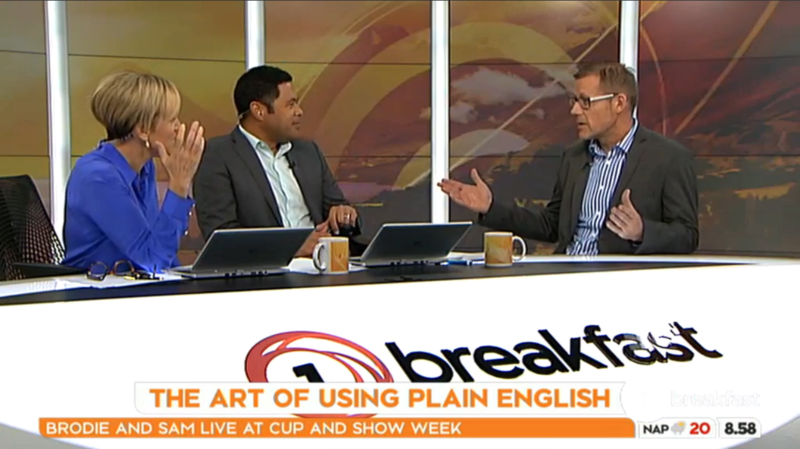 Simon Hertnon (right) discussing the 2016 Plain English Awards results with Hilary Barry and Daniel Faitaua on Breakfast (8 November 2016). I have observed over many years that most people who write for a living (eg, marketers, popular science authors, professional bloggers) opt for a familiar tone, but most people who write as a part of their job (eg, advisers, managers, administrators) opt for an impersonal tone. This difference represents an opportunity that is sharply illustrated by last year’s Award winners. One winning entry illustrated why the default writing style of business and government – which I would characterise as formal, exhaustive, and impersonal – regularly fails to meet the needs of today’s information-overloaded reader. The other winning entry provided an exemplar for what business and government writers can and should do to improve the quality and usefulness of their writing. That is, to employ a familiar, confident, no-nonsense tone. Is the tone of your writing impersonal or familiar? Let’s explore the implications. Both documents are about 1700 words long (that’s about five A4 pages), but there the similarities end. … a classic example of the myth that a verbose and impersonal document is somehow more professional than a concise and engaging one. This 1700-word document contains just 16 sentences, but their average length is 34 words, with the worst sentence clocking in at 62 words! The document’s focus is on the organisation and department rather than the role and reader. Even within this single bullet point, the writer is stuck in the mode of exhaustively listing stuff. There are nine nouns (or noun phrases): Advisor, data management practises, data integrity, quality reporting standard, provision, business units, data handling, data extraction, reporting. It is a well-known and very-well-ignored fact that humans can, on average, hold about seven items in their short term memory. A single bullet point containing nine nouns is highly unlikely to be comprehensible. Add four activities (working, ensuring, assuring, and advising) and incomprehensibility is all but guaranteed. You will likely have noticed other issues with the bullet point text. For example, in a possibly sub-conscious desire to sound clever, the author opted for embellished phrasing such as ‘work collaboratively with’ (instead of ‘collaborate with’) and ‘through the provision of advice’ (instead of ‘provide advice’). Our judging panel concluded that the writer’s primary goal could not have been to communicate a comprehensible set of useful messages. Perhaps the writer would have argued that the bullet points are effectively reference lists. But then what is a reader actually supposed to read and understand? The 16 mega-sentences? Perhaps the writer had already written a punchy, easy-to-read advertisement for the role and the job description was purely for reference. That may well have been the case, but even reference material needs to be easily comprehensible. Pleasingly, Parliamentary Service accepted their award with good grace and humour (see the video) and a pledge to do better. The NZIER report is a breath of fresh air to readers used to struggling through lengthy, jargon-filled advisory documents. The authors have done the work — as expert advisors should always do — of crafting a complex topic into simple but sophisticated written advice. If this style of advisory writing was the norm rather than the exception, decision makers across New Zealand would not only be better informed, they would have more time and energy available to think about what to do with the advice they receive. If you write as part of your job, I recommend you read this report. You can download the report from the NZIER website. Are arbitration hearings carried out behind closed doors? Many hearings are now highly transparent. Some are open to the public and are available to be viewed online. New Zealand’s FTA with Korea requires ISDS proceedings to be open to the public, for example. This passage contains 5 sentences and 45 words, with an average sentence length of just 9 words. (Note, the abbreviations – FTA, Free Trade Agreement, and ISDS, Investor-State Dispute Settlement – were both spelt out earlier in the report.) Despite a complex topic, the sentences are simple, confident, and easy to understand. Certainly, the report contains longer sentences, but its average sentence length is still less than half that of the job description. As the passage illustrates, the report’s tone is familiar; but I can assure you its overall style is not informal. The report contains data (presented in 1 table and 2 infographics), 5 legal quotations (consistently presented in bold italic orange text), and 19 footnotes. It is thorough, but not stuffy. In summary, the NZIER report illustrates how even complex advisory writing can be succinct, simple, and highly effective. It proves that formal content and a familiar tone can be expertly combined into writing that is persuasive because of its sophisticated simplicity. Overstated complexity creates confusion, not clarity. As I mentioned earlier, I encourage you to read the NZIER report. It’s a goldmine of good technique and I now include a copy of it in the course materials of my Writing Essentials course. I also encourage you to think about your own writing style. Are you stuck on auto-pilot, studiously listing information rather than creatively crafting a useful message? Perhaps only habit is stopping us from making a familiar tone the new norm of business and government writing. Don’t put off improving how you write, or how you manage writers. Attend Simon’s public courses in Auckland or at Victoria Professional and Executive Development in Wellington. Entries for the Plain English Awards close 31 August. Posted in Information design, Writing skills. Simon is the founder of Nakedize. He is the author of several books and is an Associate of Victoria University of Wellington Professional and Executive Education. 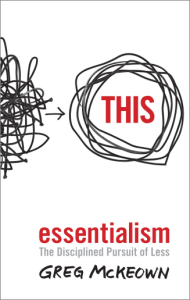 Essentialism is the disciplined pursuit of doing less to be able to do what matters. Hear Simon Hertnon's talk on Essentialism. Or buy the book.